Mark Newman, a professor of physics at the University of Michigan at Ann Arbor, took maps of the 2008 election and made a series of “cartograms” from them. 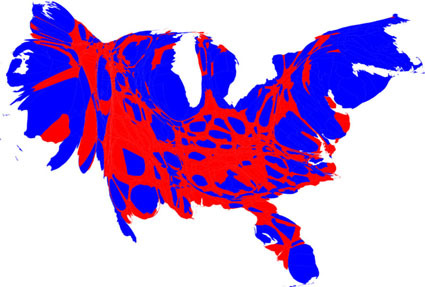 He took state-level and county-level election results and population data and to make different representations of the United States. It’s a nice example of how facts can be interpreted in many different ways. This is the main map. 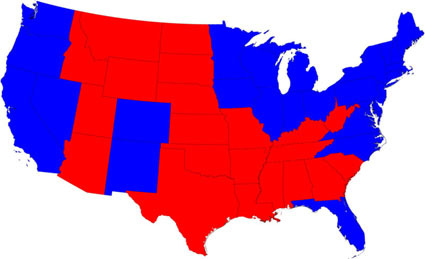 It shows the lower 48 states colored either red or blue depending on who won each state: Red for McCain and Blue for Obama. This is the map you’ve probably seen many times over already. 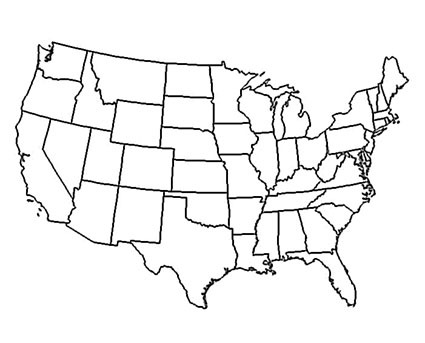 This map is the the United State stretched and skewed by special software so that each state is sized according to it’s population. This map has each red/blue section broken down further from the state level to the county level, which gives a more accurate picture of the country as a whole. This map shows each county re-sized according to it’s population, and then colored red or blue. 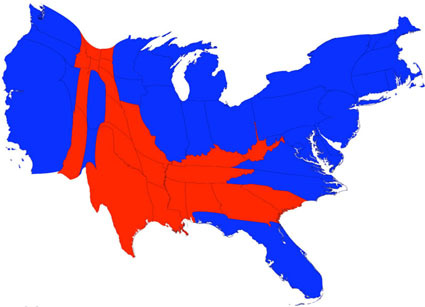 This map in particular shows how Obama has the advantage in large cities and population centers, while McCain has uniform support across the more sparsely populated American landscape. When the map is broken down to shades of purple indicating levels of support, a whole other aspect of information becomes visible. Instead of just the red/blue or win/loss colors, shades of color in-between can illustrate areas where a candidate just barely won, or won convincingly. Finally, when you combine all of these maps, you can see the country broken down by the population of each county, and election results shown on a scale of colors from red to blue. My point isn’t that these maps are a better way of looking at the election results, just that there are different ways of displaying the same facts. They illustrate the ability of the media-makers to broadcast facts in a way that jives with their opinions.